Buy Vego mini whole hazelnut vegan chocolate bar 65g in the UK from our online shop or directly from our independent Scottish store. Made with fine Italian hazelnut paste, hazelnut cocoa cream and whole hazelnuts all blended together. Vegan chocolate bar. The Vego Mini Whole Hazelnut Chocolate Bar is a more modestly sized version of the original Vego bar. It has an incredibly rich, creamy taste and is made using organic, fairtrade ingredients. It is also gluten-free. Where can you buy real Vego Bar Mini 65g safely online? If you are wondering where you can buy Vego mini whole hazelnut vegan chocolate bar 65g safely online in the UK, then shop with us. 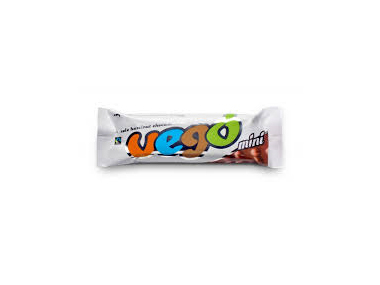 Vego Bar Mini 65g - Vego mini whole hazelnut vegan chocolate bar 65g in Chocolate and Confectionery.